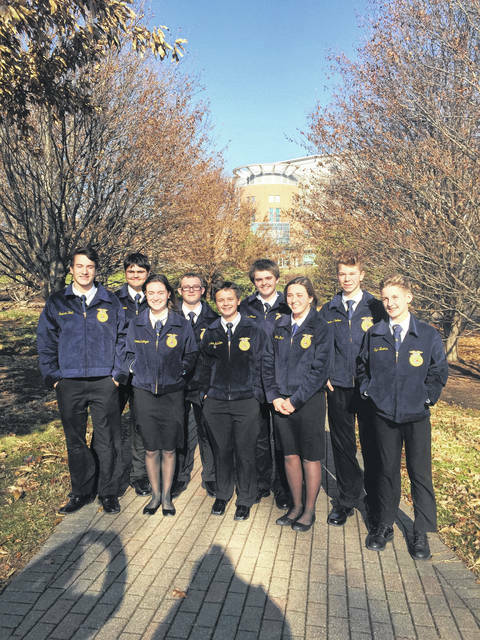 Eaton MVCTC has a void to fill after five seniors and one junior “retire” from their high school advanced, (varsity), parliamentary procedure team after an astounding fifth place finish at the National FFA Convention this past fall. This year Eaton MVCTC novice team members were freshmen Kendale Hamilton, Mallory Deaton, Ryan Brooks, Spencer Hunt, Rachal Buckler, Felix Durham, Dawson Brubaker, Jacob McIntosh, Ethan Pence, and Ethan Howard. This team competed and placed first at sub-district and first place at the district level to advance them to the state parliamentary procedure contest held in Columbus at The Ohio State University. 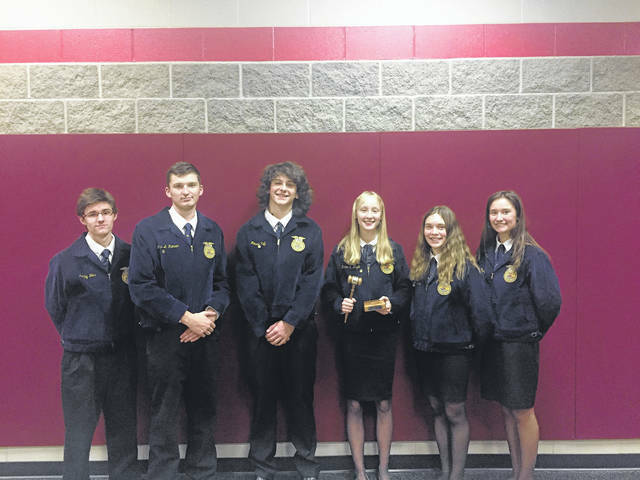 EATON — Eaton MVCTC has a void to fill after five seniors and one junior “retire” from their high school advanced, (varsity), parliamentary procedure team after an astounding fifth place finish at the National FFA Convention this past fall. These dedicated students have inspired and paved the way for other Eaton MVCTC FFA chapter members to strive to keep the excitement going for the parliamentary procedure contest. The FFA organization has set up the parliamentary procedure contest for chapters based on the following rules. First, there are two levels of teams for students from each chapter to compete. These levels are novice and advanced. The novice team consists of FFA members in the 9th grade that has not competed in a novice contest above the chapter level. In addition, FFA students on the novice chapter team can only be on the novice team for one year, and then they have to move on to the varsity team. The varsity team is more frequently known as the advanced parliamentary procedure team. The novice team is made up of eight chapter members. These members fulfill the duties of president, vice president, secretary, treasurer, reporter, sentinel, and student advisor. This highly competitive event consists of written examination, opening ceremonies, team demonstration of a business meeting, closing ceremonies and finally, judge’s oral questions to each team member. This year Eaton MVCTC novice team members were freshman Kendale Hamilton, Mallory Deaton, Ryan Brooks, Spencer Hunt, Rachal Buckler, Felix Durham, Dawson Brubaker, Jacob McIntosh, Ethan Pence, and Ethan Howard. This team competed and placed first at sub-district and first place at the district level to advance them to the state parliamentary procedure contest held in Columbus at The Ohio State University. On Dec. 6, all state finalists took the online exam portion of the contest to test their knowledge on parliamentary procedure and to determine their seed going in to the contest. Based on his high score on the online exam, team member Kendale Hamilton was ranked second in the state and the team seeded third out of 20 other state qualifying teams prior to Dec. 16, 2017 state contest. At state, this team competed against three other teams in the first round of the contest and placed second, only losing by just a few points to East Clinton FFA. Unfortunately for Eaton, only teams placing first in their heat advanced on to the final round. Overall, this team did place in the top 10 in the state. Even though this team had their sights on advancing to the National contest, they were still excited about their outcome and aspire to be a state contender next year. https://www.registerherald.com/wp-content/uploads/sites/41/2018/02/web1_IMG_5542.jpgEaton MVCTC has a void to fill after five seniors and one junior “retire” from their high school advanced, (varsity), parliamentary procedure team after an astounding fifth place finish at the National FFA Convention this past fall. https://www.registerherald.com/wp-content/uploads/sites/41/2018/02/web1_IMG_5593.jpgThis year Eaton MVCTC novice team members were freshmen Kendale Hamilton, Mallory Deaton, Ryan Brooks, Spencer Hunt, Rachal Buckler, Felix Durham, Dawson Brubaker, Jacob McIntosh, Ethan Pence, and Ethan Howard. This team competed and placed first at sub-district and first place at the district level to advance them to the state parliamentary procedure contest held in Columbus at The Ohio State University.